In the landscaping industry, poolscaping is a word used to describe the design and landscaping work surrounding a pool, in most cases, inground pools. 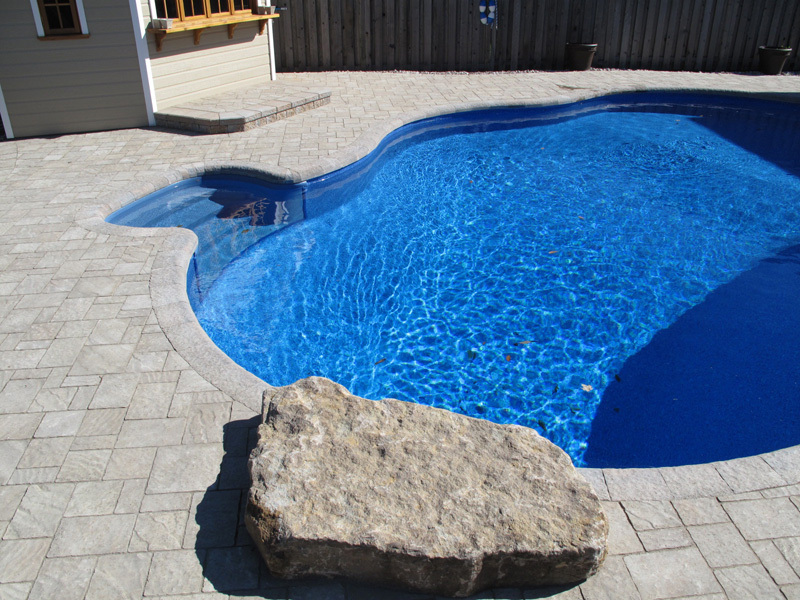 Poolscaping materials includes interlock, poured concrete, or in some cases, stamped concrete. 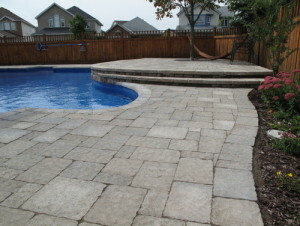 The reason it differs from conventional landscaping is the many unique factors to take into account that are specific to the swimming pool environment, including traction, salt & chlorine, mildew and water resistance. We frequently receive calls to fix-up problems that have occurred because these fundamental considerations were ignored. For your peace of mind, use a professional in the field. With over 16 years of experience, Ottawa Home & Garden are specialists in poolscaping and know how to avoid all the common mistakes. Not only do we have a vast knowledge of products and quality workmanship, but we also offer initial swimming pool design ideas at a fraction of the cost of a landscape architect. By providing you with professional landscape design plans, we will give you a clear vision of how the swimming pool will become an integral element in the overall design of your backyard. The next step is making your design a reality. Before meeting with our design team, prepare some ideas and visual references for what you want. Tear out pictures from magazines, or many find inspiration on Pinterest and collect ideas online. Whichever way you choose, have these images on hand at your consultation, and we will use them as a guide in your pool design. We all know the hardest part of any project is getting started. To put your ideas in motion, contact us for a free consultation. We will guide you through every step, from design & planning to the finished product. Let’s make your backyard dreams a reality! Ottawa Home and Garden for any project. team to anyone who is considering landscaping! Would you like to to join a well established Landscaping team?